Got questions about the OT Mom E-books? Click on the quick links below to see the answers to common questions. If you can't find the answer to your question here, then you can contact me directly. However, it may take me a couple days to reply . So, check out these FAQ first! What kind of e-books are these? What ages of children are the e-books aimed at? How do I purchase the e-books? I don't have PayPal - How can I pay? What about school purchase orders? How can South Africans pay? Do I need a Kindle to use the e-books? How do I download OT Mom e-books? May I store my e-books on more than one device? May I share the e-books with friends? OT Mom e-books are well laid-out PDF documents that you download after payment. You can then open up and read the document on a regular device. You save the PDF to your computer, and from there you can print out and bind the entire e-book or just the pages that you want. The e-books are in PDF file format, so you will need a PDF reader such as Adobe to open and read the e-books. NB! The download link is only valid for 5 days or 3 download attempts so don't wait too long to download! However, expired links may be reactivated. Younger Kids: most of the activities are suitable for younger children, depending on their abilities. I recommend that you introduce activities in a playful manner, and enjoy them as time spent with your child. If your child struggles, take a break and come back to the activity at a later stage, perhaps after trying some of the easier activities in the e-books. Older Kids: older children who are struggling with gross and fine motor skills can still benefit from activities in the e-book. However they often respond better to the activities being done as an exercise routine (eg 10 snake curls and 10 donkey kicks in the morning) as opposed to a fun playtime activity that mom initiates with younger kids. Older kids are also able to understand the reasoning behind the exercises, so do take some time to explain the benefits of each activity/exercise and the importance of doing it correctly. Fine motor skills can also be addressed with certain activities being assigned as daily exercises before handwriting/homework sessions. If your child is currently receiving any kind of intervention or has undergone an occupational therapy assessment, please consult with your therapist regarding which activities are best suited to your child’s abilities. My advice is usually to start with what you know your child can already do (or almost do), and/or with what interests them, and then work on activities that are more challenging after that. As every child is different and has been exposed to different environments, I can't really say where to start for a specific child. The e-books are a guideline for exposing your child to activities to help their development, based on resources you may have at hand. The activities in each e-book have been approximately categorized according to aims. There are a range of activities given in each category, usually not in any particular graded order, so you can choose activities that fit your child's interests and skill level and/or the resources that you have on hand. Fine Motor Skills: The activities are categorized according to the developmental aims - starting with hand strength and hand dexterity and then moving on to finger exercises. So an older child with weak hands may start with hand strength activities, and a younger child with reasonably strong hands but who struggles to isolate finger movement could start with the dexterity exercises and move onto finger exercises. The wrist exercises can be done at any age as the child needs them. Scissor Skills: The activities and suggestions are to help kids move through the different stages of cutting out - so a younger child who has mastered cutting on a straight line may move straight onto cutting on curved lines; whereas an older child who struggles with getting the movement needed with scissors may need to start with some of the suggested snipping activities. Unfortunately, OT Mom e-books are only available in electronic format. 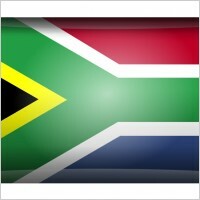 As I live in South Africa, the cost of printing and international shipping would be prohibitive. The electronic format and the payment processing by PayPal makes the information more accessible to my international visitors. You can print out and bind or file the e-books to make your own hard copy. Best of all, you don't even have to print out all the pages, just the ones you want to refer to! You can even just access them on your device and save on paper completely . If you work within an organization (such as a school, clinic, institution) and wish for different people within the organization to make use the e-books, please purchase the "Organization" version. However, if you have benefited from this site, and plan to make multiple copies of the e-books, please do the right thing and purchase the organization version! Technically speaking, it is theft when you make copies without paying for them! 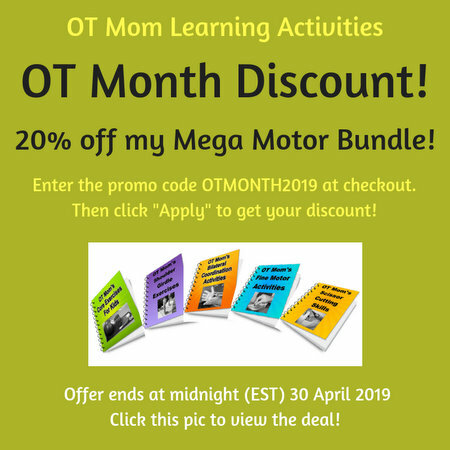 How Do I Purchase The OT Mom E-Books? To purchase the e-books you will need a credit card (some debit cards also work) OR a PayPal account. Click on the "Add To Cart" button to choose your e-books (the Mega Motor Bundle is the easiest way to get them all) and then a little window opens up. Click on "Checkout with PayPal" which will take you to PayPal. If you have a PayPal account already then you will know what to do. Make sure PayPal has an up-to-date email address for you! If you are going to pay with your credit card, then you have to fill in the card details on PayPal and follow their instructions. Make sure you make no typos in your email address! It is really simple to do - when you click on "Checkout" after adding e-books to your cart, you are given the option of paying by card or with a PayPal account. Just choose "card" and enter the card details. See the question above for more details on how to choose your OT Mom e-books and pay. There are no shipping fees, as OT Mom e-books are electronically delivered. That means you get a PDF document that you download and save to your device. You can then read it on your device (PC, laptop, tablet, phone...) and/or print it out as you choose. After payment, you will automatically receive an email with a unique download link. The link allows you to download the e-book to your computer and save it to read/print at leisure. Unfortunately, I am based in South Africa and am unable to do school purchase orders from here. You will need to purchase directly from my website and request reimbursement afterwards. PayPal will send you a proof of payment that you can use as in invoice for this purpose. My fellow South Africans can pay me in ZAR via an EFT from a South African bank and pay far less than the current exchange rate! Or download my price list right away. The PDF will start downloading immediately when you click on it (it is less than 30KB) - look for it in your downloads folder if it does not open up immediately. Follow the directions in the PDF to pay me and send me an email confirming your payment and which OT Mom e-books you have ordered. Once your payment has cleared, I will send you an email with the download links. NB If you don't email me, I won't have your address, as the banks don't include those details! I can only send the e-books once I receive those details from you! No, these e-books come in PDF format, so they are opened, saved and read on your PC/laptop/tablet like any other document. How Do I Download the OT Mom E-Books? NB! The download link is only valid for 5 days so don't wait too long to download! Click on the download link in the email - it will open a browser window (Firefox, Chrome, Internet Explorer etc) that says "click here to download OT Mom's [name of e-book]". Click on the link in the browser. A little window should open up, that says "you have chosen to open OT Moms [name of ebook]”. You are given 2 options: to open (with Adobe reader) or to save the file. I personally find it best to choose the "open" option. The e-book will then open on your screen (this may take a few seconds). Once it is open, click on "file" and then on "save a copy" and save the e-book to wherever you want to keep it. Now you have a copy on your computer that you can print from whenever you like, or read it on your computer. I thought I was doing a great job of keeping my kids active, until a few people pointed out my eldest was 'weaker' than she should be. I subconsciously knew this, but also realized that not everyone will be an athlete. Your website / books made me see that I can help her be her best and strongest, without making her feel pressured or steer her off exercise. When you completed your purchase, your download links should have displayed on a window in your browser. Check your browser history to see if you closed it by accident. You should also have received an email with your download link within minutes of payment. There are a few reasons why you may not have received your email. The email went to your trash folder instead of your inbox. Check your spam folder! The email address on your PayPal account may have been an out-of-date email address - check your PayPal account to see to which address it was sent. You may have entered a typo when you entered your details when paying by card. If you are unable to track down the errant email or browser, just contact me through my site, with the details of your transaction (to help us track it down), and we will organise a new email to the correct address within a few days. As I am a real, live, homeschooling OT Mom with a crazy schedule, I don't always get to my website admin daily, but I will always get back to you as soon as I can :-) . I apologize for the inconvenience of the expired link. It is a built in safety feature by the server that hosts the OT Mom e-books. The download link is unique to your purchase and is valid for 5 days or 3 download attempts. If the link is too old, or you have made too many attempts to download, then you will see the "expired" message. Just contact me through my site and explain your situation, and we will get back to you with a new link within a few days. Please give the details of your transaction to help us track it down. As I am a real, live, homeschooling OT Mom with a crazy schedule, I don't always get to my website admin daily, but I will always get back to you as soon as I can :-) . How Do I Use The E-Books? Once you have downloaded the e-book and saved it to your computer (follow these instructions if you need help), then you can access the e-book whenever you like, in order to read it or print it out. Some people have printed out each e-book in its entirety and placed them in a binder for easy access. Some people find it easier to read the e-book on their computers and just print selected pages. Others access them from their tablets. You may save the e-book to a travel device/memory stick to use at work as well as at home. As long as the e-books remain for your personal use, you can use them in the most convenient way for you. You may save the e-book to a travel device/memory stick to use at work as well as at home. If you need to make multiple copies for use within a school or clinic, or make the e-books available on multiple devices for different users within an organization, please do the right thing and purchase the Organization Version. With the Organization Version, you can allow up to 10 users, or print up to 10 copies, for the price of only 3! Sorry, this is considered to be theft, as the author is not being paid for her hard work in writing and compiling the e-books. Please respect the copyright and do not make copies of this e-book for others, or forward it to others. You may also not copy the information into your own work to pass off as your own. However, if someone you know is in financial difficulty but would benefit from the OT Mom e-books, please ask them to contact me and make a special request for a free download, explaining their situation. I have kept my e-books affordable in this present economic climate to make them accessible to as many as possible. Thank you for your interest! I hope these FAQ answered some of your questions! Get a Discount When You Purchase More Than One E-book!